Western Digital has this week introduced its new 10TB datacenter-class helium-filled WD Gold hard drive. This drive, according to WD, boasts higher performance compared to its predecessor combined with lower power consumption. The new WD Gold 10 TB will be Western Digital’s flagship HDD for data-centers and will compete against hard drives of similar capacity from Seagate and HGST. The WD Gold 10 TB drive (WD101KRYZ) shares the hermetically-sealed 3.5” platform with the WD Gold 8 TB, which was introduced earlier this year. The new drive is based on multiple PMR (perpendicular magnetic recording) platters, features a 7200 RPM spindle speed, a double-size 256 MB DRAM cache and is based on the SATA 6 Gbps interface (right now, WD does not offer Gold HDDs with SAS interface). Just like the other WD Gold HDDs, the new 10 TB model was designed for a variety of server applications, including small to medium-scale machines, as well as rack-mount data center servers and storage enclosures. The drive is promoted as being optimized for RAID environments and supports enhanced RAFF technology that protects against vibration (by monitoring linear and rotational vibration in real time) as well as head positioning system with two actuators, which increases positional accuracy. In addition, the WD Gold 10 TB also supports time-limited error recovery technology (TLER), which prevents drive fallout caused by extended HDD error recovery processes. The WD Gold 8 TB model released earlier this year already featured a number of performance and energy efficiency optimizations and the WD Gold 10 TB hard drive is designed to improve even further. The 10 TB drive offers a 249 MB/s sustained sequential transfer rate (up from 205 MB/s in the case of the 8 TB model). Moreover, maximum power consumption of the WD Gold 10 TB is 7.1 W (down from 7.4 W for the 8 TB model, and significantly less than 8.6 W consumed by HGST’s Ultrastar He10 around the same ballpark as the 6.8W operating power number for the HGST’s Ultrastar He10 SATA model). Western Digital does not reveal many details about how it managed to improve performance and energy efficiency, but it is logical to assume that increased areal density, an enlarged cache, and further tweaks of electronics are responsible. As for reliability, just like other WD Gold series HDDs, the new one is rated for 2.5 million hours MTBF and comes with a 550TB of writes per year rated workload, which at the rated write speed gives 100 minutes of full sequential writes per day. 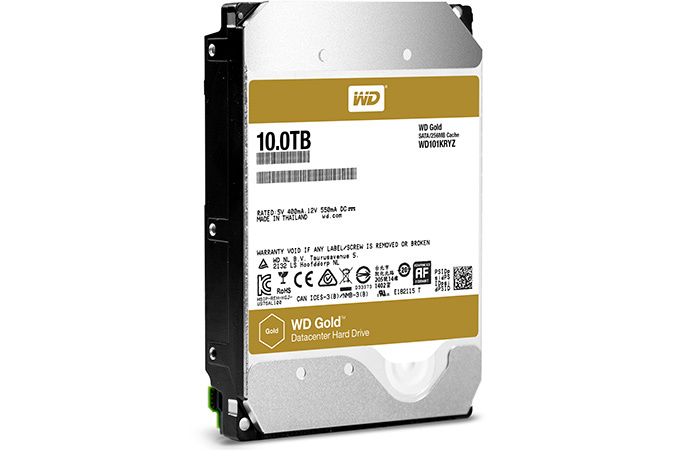 Western Digital’s Gold 10 TB hard drives are currently available at select U.S. distributors, resellers and will shortly be sold in the company’s online store. The HDD costs $847.99 when bought from CDW.